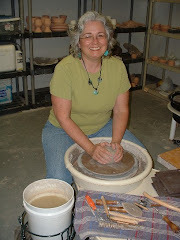 If you would like to buy one of a kind pieces featured here on the blog or at my website, http://www.bluegillpottery.com/, use the phone number or email address above to reach me. There will be an online store coming soon. Thanks! I also have a shop on Etsy where I sell a line of retail work that is only available through me or at the shows I participate in. Go to www.etsy.com/shop/bluegillpottery to see what's up.